【Large Shooting Space】24"x 24" shooting platform provides enough operating space for gun and arms while shooting. Besides, there are two pockets for ammos and other accessories. 【Portable Design】This shooting table allows be folded compactly, which is convenient for storage. For the 35lbs light weight you can carry this table to where you want. 【Many Applications】This high quality shooting bench kit is ideal for hunting, target practice, sighting, and dialing in scopes. Material：steel, sponge and 600 Denier polyester fabric. Dimension of table platform: 24"×24"
Dimension of seat platform: 17"×12"
Steel frames make sure this shooting table durable for many years use. You can carry the table to outdoors for the light weight and folding design. No matter this table applied on hunting, target practice, sighting or dialing in scopes, we promise you will get most comfortable shooting experience! 【Durable Construction】All steel frames adds the stability of this shooting table, the weight capacity is up to 300lbs. Powder coasted design ensures the frames will not get rusty, perfect for outdoor using. 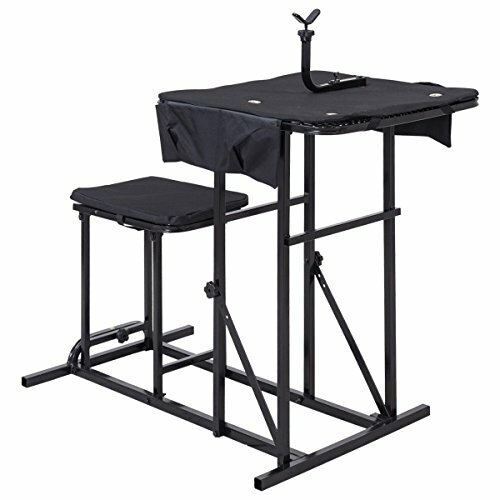 【Height Adjustable】The height of table and the shooting rest can be easy adjusted, which makes this shooting table is suitable for adults or youths, men or women, and also convenient for any landscapes. If you have any questions about this product by BUY JOY, contact us by completing and submitting the form below. If you are looking for a specif part number, please include it with your message.